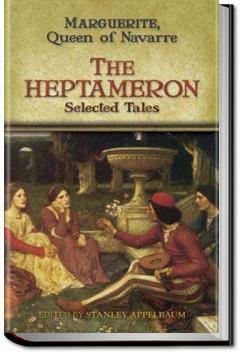 THE HEPTAMERON (here Volume 3 of 5), first published posthumously in 1558, is divided into seven complete days containing 10 stories each, and an eighth day containing only 2 stories. The stories, many of which deal with love and infidelity, resulted in "accusations of looseness" by critics of the day. The author, Margaret of Navarre (also known as Margaret of Angoulême) became an influential woman in the intellectual and cultural circles of the French Renaissance.
. . . are handsome and young, fearing to fall into the same difficulties as others. And since this gentleman is discreet and virtuous, as you yourself know, and tells me nothing that is not honourable and right, what harm can I have done to you and to those that have spoken of the matter, by seeking from him some consolation in my grief?" "I can see, my lady, that you speak the truth, and know that you are not treated by your father and mistress as you deserve to be. Nevertheless, since people are speaking about your honour in this way, you ought to converse with him no longer, even were he your own brother." "Mother," said Rolandine, "if such be your counsel I will observe it; but 'tis a strange thing to be wholly without consolation in the world."